John Coates' long political career, first as a Member of the House of Representatives for the seat of Denison (1972–75) and then as a Tasmanian senator (1981–96), mirrored the fortunes of federal Labor over three decades. John Coates was born in Melbourne on 23 March 1944, the son of Graeme Coates and his wife Catherine, née Croker. Both his parents were primary school teachers in rural NSW, his father a school principal. Educated at Junee Primary School and Bowral High School, Coates attended the University of Sydney where he developed his leanings towards the left of the political spectrum. He graduated as a Bachelor of Science, majoring in biochemistry, and took up a position of tutor, and later senior tutor, in biochemistry at the University of Tasmania in 1967. In that year, he married Doreen Mostyn, a mathematics teacher; they had two sons and a daughter before they divorced in the 1980s. In Tasmania, Coates consolidated his allegiance to the political left, participated in anti-Vietnam War marches and joined the Mt Stuart branch of the ALP. Encouraged to enter the preselection ballot for the House of Representatives seat of Denison for the 1972 federal election, Coates won an absolute majority in the ballot to contest the seat. In the historic ALP election victory of 1972 that brought Gough Whitlam to power, Coates won the seat of Denison with a significant swing in his favour, doing his bit to ensure that Labor achieved a clean sweep of all five Tasmanian House of Representatives seats. Aged twenty-eight, he became the youngest member of the new Parliament, a distinction previously held by Paul Keating. The themes of Coates' first speech as an MP in March 1973 resonated throughout his political career: socialism, 'We are a socialist party and we should not be ashamed to say so'; peace, 'Vietnam is a blot on this country for which it can never fully atone'; and environmentalism, 'Being from Tasmania where there are so many natural assets worth preserving, I am perhaps more aware than most of the need for conservation'. As part of the Whitlam Government he was involved in the development of Medibank, the forerunner of Medicare. Tasmanian Labor Senator Nick Sherry, who, not being from the Left, had little reason to exaggerate Coates' achievements, later described him as 'one of the major architects of our health care policy through that era'. Sherry also noted Coates' influence in having the Antarctic Division headquarters moved from Canberra to Hobart. Speaking in 1975 Coates noted that during the 1972 election campaign he had promised to work for the transfer of the Antarctic Division to Hobart and that during 1973, through a series of submissions to the Minister for Science, had 'convinced him of the feasibility and desirability of the move'. He commented that the decision had shown 'that a back-bencher with an idea can see the results of that idea benefit his own electorate'. Coates was re-elected in the double dissolution election of 1974 but was defeated the following year by the Liberal candidate, Michael Hodgman, following the Whitlam dismissal. After his defeat he went to work in the electorate office of Labor Senator Ken Wriedt, a former minister in the Whitlam Government and Leader of the Opposition in the Senate. He remained very active within the state ALP and held a number of executive positions within the state branch, including as chairman of the rules committee (1974–77). That committee, later referred to as the Coates committee, pushed for extensive reforms to the structure of the party's Tasmanian branch, following the devastating loss of all five Tasmanian House of Representatives seats in the 1975 double dissolution election. The reform proposals, designed to improve solidarity and limit the capacity of individuals to organise their own branches, were bitterly contested but ultimately succeeded. Although, in 1977, Coates again unsuccessfully contested the seat of Denison, the retirement of Wriedt from the Senate to contest Denison at the 1980 election effectively created a pathway for Coates into the Senate. Coates was duly elected in 1980 and took up his seat in July 1981, and he was re-elected in 1983, 1984, 1987 and 1993. In 1984 he married for a second time, this time to Rosalind Escott, an occupational therapist, with whom he had a son. Consistent with his first speech in the House, which he quoted from at times, in his first speech to the Senate on 26 August 1981 Coates stated: 'I am proud to be part of a socialist party which stands for peace in this world and tries to conduct itself in a democratic way'. Coates also made no secret of his 'mixed feelings' about being elected to the Senate. He stated his belief that the Senate should be known as the 'second house' rather than the 'upper house, which implies some superiority it ought not to have'. Although he never lost his ambivalence to the Senate as an institution, in 1985 he did note his preference for the Senate's 'emphasis on committee work' to 'the gladiatorial atmosphere of the House of Representatives'. The basic problem is that those of whom I speak are so proud of the Senate and all they believe it stands for, they so revere it, that they have allowed themselves continually to overstep the mark in defending it, promoting it and manipulating it ... They have become active players going beyond giving procedural advice to involving themselves in the process. They try to run the Senate, not just the Department of the Senate. Over his eighteen years of parliamentary service Coates served on twenty-three parliamentary committees. He was chairman of the Standing Committee on Regulations and Ordinances (1983–85) and, notably, he chaired the various finance and public administration committees for thirteen of his fifteen years in the Senate: Standing Committee on Finance and Government Operations (1983–87); Standing Committee on Finance and Public Administration (1987–94); and Finance and the Public Administration Legislation Committee (1994–96). The finance and public administration committees tabled ninety-seven reports under Coates' chairmanship including significant reports on the accountability of Commonwealth bodies, the timeliness and quality of annual reports and the quality and usefulness of budget documentation. As chairman, he continued the work of his immediate predecessor Senator Peter Rae to make both statutory and non-statutory bodies more accountable to Parliament. Like Rae, Coates was concerned about the proliferation of non-statutory bodies and the spiralling costs of maintaining them. On several occasions in the late 1980s he called on the Labor Government to introduce a central register of non-statutory bodies to formally identify their functions, membership, financing and staffing. He explained that such a register could act like a catalogue in a library, removing obstacles that may hinder greater accountability and transparency of these bodies. To Coates' satisfaction, in response to the committee's recommendations, the government looked to introduce a register of sorts through introducing a computerised system recording the extent to which equal opportunity employment practices were being applied by government bodies. However, it was the committee that went on to publish lists of statutory and non-statutory bodies and, ultimately, of all Commonwealth bodies, a task that was finally taken on by the government after Coates had left the Senate. In 1990 Coates tabled reports of the Finance and Public Administration Committee on the development of the senior executive service (SES) within the public service. The reports highlighted the committee's concerns about the Labor Government's plans to introduce performance-based pay for SES officers in the absence of a formal cost benefit analysis and associated formal, verifiable targets. The committee called for greater accountability of the SES and was 'sceptical of many of the claims of the so-called managerialists' that performance-based pay would pay for itself through productivity gains. The following year Coates criticised the government's response to push ahead with its scheme; he claimed that performance-based pay for SES officers would not work and had not worked anywhere else in the world. In February 1994, in speaking to a follow-up report, Coates stated: 'I very much regret that the government adopted the policy of performance pay'. He called on the government to abandon the policy which he described as 'conceptually flawed'. When the Labor Government decided against abandoning the policy Coates again expressed his disappointment, criticising what he saw as a 'faulty process of policy development'. Coates described his involvement with the various finance and public administration committees as 'a thankless task—it was certainly not one that made the headlines in the Tasmanian media, but it was a task that I mostly enjoyed'. Looking back, fellow Tasmanian Senator John Watson highlighted Coates' dedication to the work of the committee: 'It was not his secretary who was doing the adjustments to the final drafts ... it was John Coates himself. So his style was very much reflected in those reports'. This assessment was affirmed by Senator Sherry, who described Coates as a 'great stickler for detail'. I am a representative of the Tasmanian people ... accused of not acting in Tasmania's interests ... A very strong proportion of the Tasmanian people are right behind the Federal Government's efforts to protect the area. They may not represent a majority, but they represent a very significant proportion. I am pleased to represent them here. As he matured politically Coates modified his 'strong conservationist' stance, aware of the need to strike an appropriate balance in policy, between the interests of workers, industry and the environment. As a member of the Whitlam Government he had vehemently shared his colleagues' opposition to the Vietnam War. However, the circumstances were different almost two decades on, when he and Labor colleagues Senator Bruce Childs and Senator Margaret Reynolds abstained from the vote on the Labor Government's motion to commit troops to the first Gulf War. In his one speech on the matter he made an impassioned plea against the government's position: 'I fear that this war will go on and on, and, even worse, that it will escalate and lead to even more appalling turmoil and destruction in our world. I am deeply troubled by that and I do not want to be on the record as approving it'. Coates' stance brought him attention he did not seek and put him in conflict with the party in whose collective decision-making processes he profoundly believed. Although, in 1985, media had proclaimed that Coates was 'regarded by colleagues as a ministerial frontrunner', as was later noted by Senator John Faulkner (NSW), given his willingness to stand true to his convictions and challenge the decisions of party leaders, it was unlikely that he would ever achieve quick advancement through the ranks of the party. In 1993 Democrat Senator Janet Powell cited Coates as an example of 'the quiet achievers', 'who often band together to shift the party heavies ... from an unacceptable policy position' and 'who rescue the committee system ... from partisanship'. 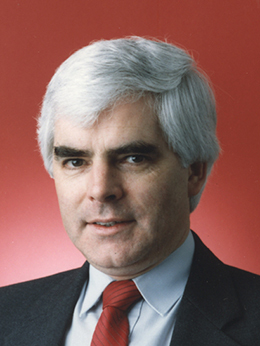 On 20 August 1996 Coates formally resigned from the Senate, his departure precipitated by Labor's defeat in the March 1996 federal election after thirteen years in power. In his resignation speech Coates acknowledged his good fortune in serving his party and his state during the Whitlam years and then the Hawke and Keating years. Expressing a mixture of 'some regrets and perhaps some relief', he reminded the chamber that he 'had never been entirely comfortable with making speeches' or 'very good at seeking publicity'. In this as in so much else he was consistent to the end. Senator Faulkner noted Coates even handled his resignation 'in a way that typified the man: it was done without fanfare or fuss, it was straightforward and done in consultation with the Labor Party'. Faulkner also went on to describe Coates as 'a man whose absolute commitment was to the Labor Party and the labour movement ... He expressed his views without fear or favour, and did so for a very long time'. Throughout this entry the author draws on personal conversations with John Coates; Richard Davis, Eighty Years' Labor: The ALP in Tasmania, 1903–1983, Sassafras Books and the History Department, University of Tasmania, Hob., 1983, pp. 76, 78–9. CPD (R), 8 March 1973, pp. 433–5, 8 Oct. 1975, pp. 1844–6; CPD, 11 Sept. 1996, pp. 3334–5. Davis, Eighty Years' Labor, pp. 81, 88–90; Richard Davis, 'Tasmania: premiers and parochial politics' in Machine Politics in the Australian Labor Party, Andrew Parkin and John Warhurst (eds), Allen & Unwin, Syd., 1983, pp. 194–5. CPD, 26 Aug. 1981, pp. 361–4; 'Profile: John Coates', House Magazine, 3 April 1985, p. 3; CPD, 21 Dec. 1990, p. 6272, 14 May 1991, pp. 3312–4, 15 May 1991, pp. 3336–40. Standing Committee on Finance and Public Administration, Development of the Senior Executive Service, Canberra, May 1990 (interim report) and Sept. 1990 (final report); CPD, 10 Oct. 1991, pp. 1815–17; CT, 11 Oct. 1991, p. 2, 20 Oct. 1991, p. 8; CPD, 11 Sept. 1996, pp. 3332–5, 20 Aug. 1996, pp. 2694–5; CPD, (R), 8 March 1973, pp. 433–5; CPD, 17 May 1983, pp. 476–8; Davis, Eighty Years' Labor, p. 115; CPD, 8 Nov. 1985, pp. 1861–6, 11 Nov. 1986, pp. 1881–3, 24 March 1987, pp. 1253–7. CPD, 22–3 Jan. 1991, pp. 243–5, 268–9; Mercury (Hob. ), 24 Jan. 1991, p. 1; CPD, 20 Aug. 1996, pp. 2694–5. AFR (Syd. ), 21 Feb. 1985, p. 3; CPD, 27 May 1993, pp. 1548–52, 20 Aug. 1996, pp. 2694–5, 11 Sept. 1996, pp. 3331–2. This biography was first published in The Biographical Dictionary of the Australian Senate, Vol. 4, 1983-2002, Department of the Senate, Canberra, 2017, pp. 349-353.